A friend on facebook recently asked for suggestions for children's books that introduced topics of spirituality or ethics in an age-appropriate way for youngsters, and I was thrilled to mine all of the ideas gathered in the comments. 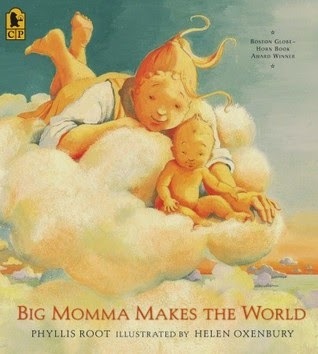 Two of the books listed were The Three Questions and Big Momma Makes the World. I love when God is portrayed as a woman, powerful and good. Mormons believe that Heavenly Father has a counterpart in Heavenly Mother and I so wish She got more air time. Big Momma Makes the World just whets my appetite for female diety. Big Momma is warm, creative, and maternal, but she's also no-nonsense, no-fuss, and completely in control. Following the pattern of creation outlined in Genesis, Big Momma creates light and dark, sun and moon, earth and sky. She commands the grass and trees to grow and delicious fruits for her baby to eat. Then, the story notes, "Lots of folks would be plenty pleased, but Big Momma, she doesn't quit a job till it's done and done right." Next it's whales, birds, and fish, "more whales and catfish and mockingbirds and crows than a little baby could shake a stick at, which a little baby could do if a little baby wanted to, since Big Momma had already made all those trees full of sticks." Finally, Big Momma finishes the job in "one Big Bang!" with every sort of animal exploding out of a burst of light. Except despite her joy in all she's created so far, something's missing. "I need some folks to keep me company." So she takes leftover mud and makes "big folks and little folks. Fat folks and thin folks. All kinds of shades of folks. And every one of those folks had a story to swap with Big Momma." Big Momma is the queen of multi-taskers, but she is a momma first, delighting in playing with her baby and showing that little baby all the wonders of the world she created. The warm illustrations invite the reader in and fit the comforting cadence of the story perfectly. His friends give him the best answers they can from their experiences, but Nikolai finds them incomplete, so he sets off on a journey to ask the wise old turtle Leo. He has the chance to help both Leo and an injured panda bear in a storm and discovers the answers to his questions. There is only one important time, and that time is now. The most important one is always the one you are with. And the most important thing is to do good for the one who is standing at your side. For these, my dear boy, are the answers to what is most important in this world. This is why we are here. 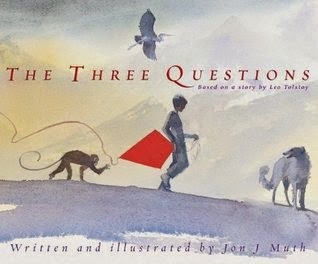 Simple, profound truths illustrated gorgeously with cool watercolors, this book is a treasure.